It's a practice more barbaric than anything else that involves animals. And it involves not just tigers. Lions, crocodiles, bears and other carnivores too are bred in captivity, in other words 'farmed' for use of their body parts for a variety of purposes. Tiger skins serve as rugs, clothes; their bones and teeth are crushed and powdered and used in oriental medicines, their brain, heart, meat, claws, whiskers - in short every part of their body is used to serve an array of ridiculous purposes. And it's one of the biggest threats to tigers worldwide. A shady and lucrative business, tiger farming enjoys backing of corrupt officials and poaching enterprises in China and southeast Asia. In places like Burma and Thailand tiger parts are openly available for sale in urban markets. In zoos and captive centers across China thousands of tigers are kept in miserable conditions in small enclosures and slaughtered daily to feed the huge market that revolves around exotic animal parts. Proponents of this lucrative business claim that since captive tigers serve the purpose, tiger farming actually 'protects' wild tigers by sparing them from poachers. This, however, is not true. Tiger farming continues to fuel the market for the oriental medicines that make use of tiger parts, thus hurting the cause of tigers. Plus, poachers still go after wild tigers since they are cheaper to obtain. A poached tiger in India is worth two and a half million Indian Rupees, roughly fifty thousand US Dollars - enough to sustain a family for their lifetime in that developing nation. Recently, in a significant move towards conservation of tigers, CITES, Convention on International Trade in Endangered Species, has issued a notification to stop tiger farming in member countries. A decision welcomed by conservationists around the world, this will serve to curb the cruel practice. However, it remains to be seen as to how effectively it will be implemented by the Chinese government which has so far been reluctant to act against openly operating tiger farms. At the same time it will also temporarily increase the demand for wild tigers greatly and necessitate greater vigil in reserves and forests against poachers. Still, one thing is for sure. If the tiger is to survive anywhere in the wild, the use of its parts in any form or place has to be abolished permanently. To read an article from 2007 that provides a close perspective on this horrible practice click here. It's truly a shame. They deserve better. They really, really do. Conservation? Yeah right. More it comes down to greed. Those tigers could be used instead to help preserve an already dwindling gene pool. The entire business of tiger parts comes down to old superstitions and snake oil medicine. 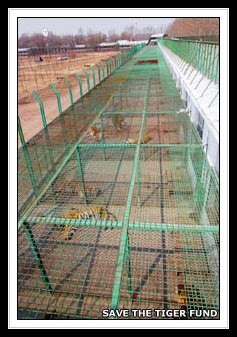 I respect the beliefs and customs of all cultures but in this case - Tiger Farming is just another sick way of making money. That tiger poaching and farming sounds horrible for the poor tigers. OH MY GOD,and man is supposed to be the most intellagent animal on the planet!!! I've never seen anything like this!! It's horible! Some times I think that this is a gool idea because it may stop pouching, but then I see how they are treated and killed. Many places like this kill the animals in horrible ways. they don't want to spend meny to be humain about it so they may skin them alive to save money. remember we raise animals to eat, and we have a ways to go in treating are food and clothing animals with respect. At least it sounds like they use the whole animal. Unlike furr farmers who only want the furr and through away the rest, sometimes the animals are still alive after they have been skun. So is tiger farmeng any worse then pig farming. The tigers need to be treated right have big cages, vet visits, and only one litter a year. that would propibly not make it profitable. Don't get me rong I hate to see the animals treated like that and will do all in my power to stop it, I am just saiing that we have to remember that we do the same thing in the U S but with differant animals. say there are a certain number of fish in the sea say 10..and 4 fisherman. i tell the fisherman that they are allowed to fish wherever they want and for the first month every fish they bring back i will give them 10 cents. If although they wait till next month when the fish are bigger ill give them 25 cents per fish. the fisherman are then released to go fish. the practical thing for the fisherman to do is to wait for the fish to grow before fishing. the true reality is, although, each fisherman will try to fish as much of the fish as possible. this is because each fisherman will be afraid that next month, there wont be any fish left. now if i were to say, you are allowed to fish here, you are allowed to fish here...and so on, each fisherman would have there own place that only they can fish, so they would have incentive to let the fish grow in that area, of course. it only makes sence to wait for the fish to be worth 25 cents or even 10 dollars before fishing them... the first fish to go would be in waters that aren't clear as to who owns them and unclaimed waters. in setting up these restrictions and property lanes, both the fish and the fisherman should prosper. i am not a professional on the subject, and i am not claiming that this is the right thing to do. i am simply stating an opposing arguement as to the benifit of farming tigers and such. Its funny how I feel sad IF the world truly ends soon. Not for myself, not for Man, but for all animals on earth. I wonder how the tiger farmers would feel if they were put in cages and stuffed in with other females just for the purpose of breeding then slaughtered or skinned alive. Thanks a lot for such an incredible material that explicitly shows all the peculiarities of the tiger farming with notes helper fresh. I liked the post, thank you very much for sharing!